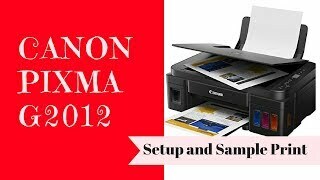 The new Canon PIXMA G2012 InkTank Printer is popularly famous for its high-volume in addition to low-cost printing, scanning, and copying. It leaves the optimum performance while bringing down the prices efficiently. The Integrated Ink Tank System produces a streamlined printer body. These ink tanks have high durability, which offers the simplicity of tracking ink amount and organize the refill consequently. Its new Panel Design offers easier operation. The instinctive 1.2-inch panel layout makes it effortless for the printer to perform the function of generating multiple copies or scans with extreme ease. The printer is a budget-friendly alternative. This printer includes two additional bottles of GI790 ink (black) from the box, along with 1 each of cyan, yellow, magenta, and black. It prints magnificent border-less photographs and crisp black text documents up to A4 dimensions with the aid of Canon’s Hybrid Ink System. With high page yields up to 6,000 pages in black up to 7,000 pages in color, PIXMA Ink Cheap printers are unusually cost-effective for high quantity printing. Experience vibrant, sharp and economical printing by means of Genuine Canon Consumables.